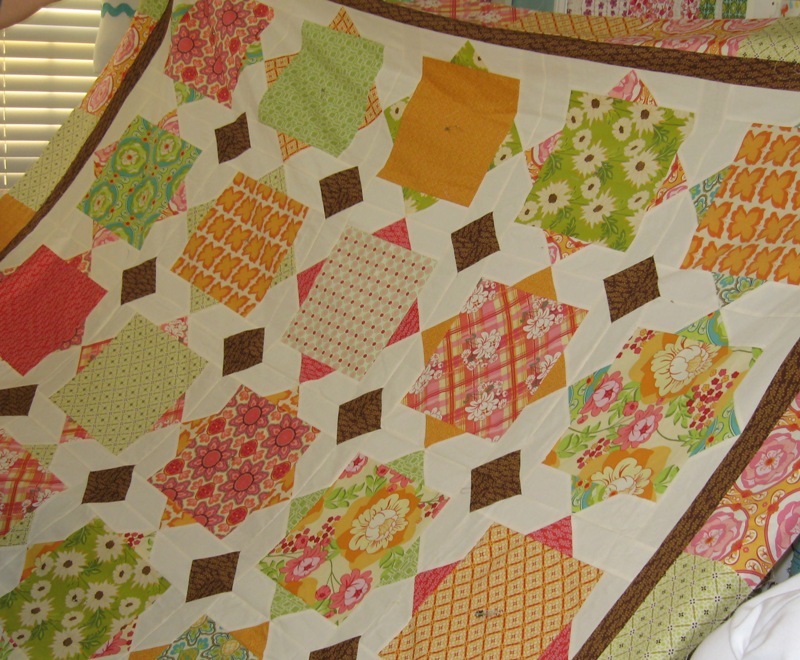 You are currently browsing the category archive for the ‘quilt retreat’ category. A trip to the Double Dutch Manor quilt retreat a couple of weeks ago for Paige was exactly what she needed to refresh her creative spirit. Double Dutch was a terrific hostess. They provide all of your meals, so no cleanup. 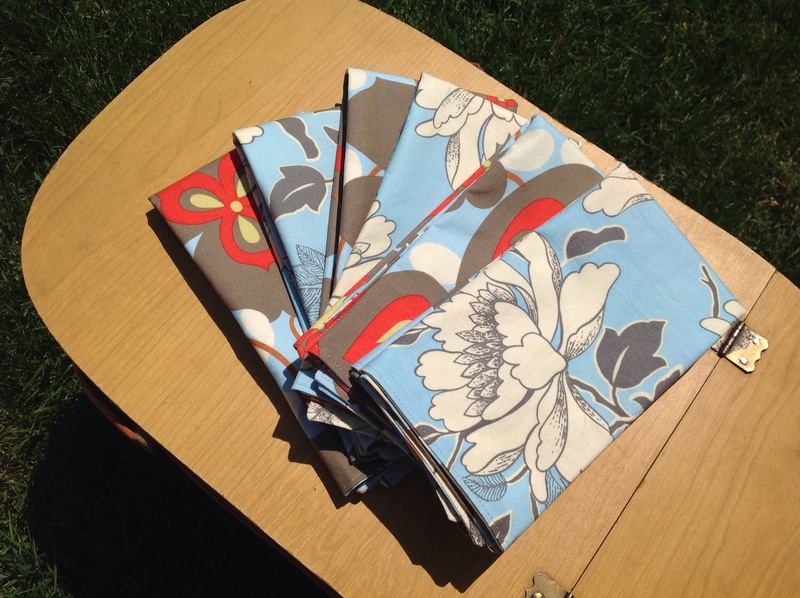 You can just get right back to your sewing! 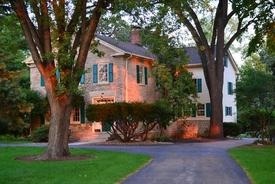 Located just 50 miles outside of Chicago and near major highways, makes it easily reachable for people coming from Indiana, Iowa, Michigan, Minnesota and Wisconsin. 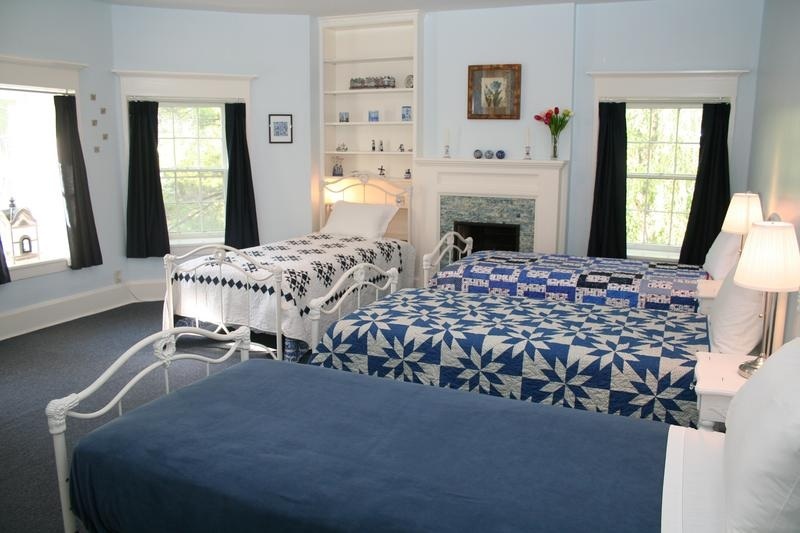 They have the cutest rooms too! I love the blue one, called Old Dutch. And plenty to do in the area too. The local quilt shop, Prairie Stitches Quilt Shoppe in Oswego, gave out $25 gift cards. 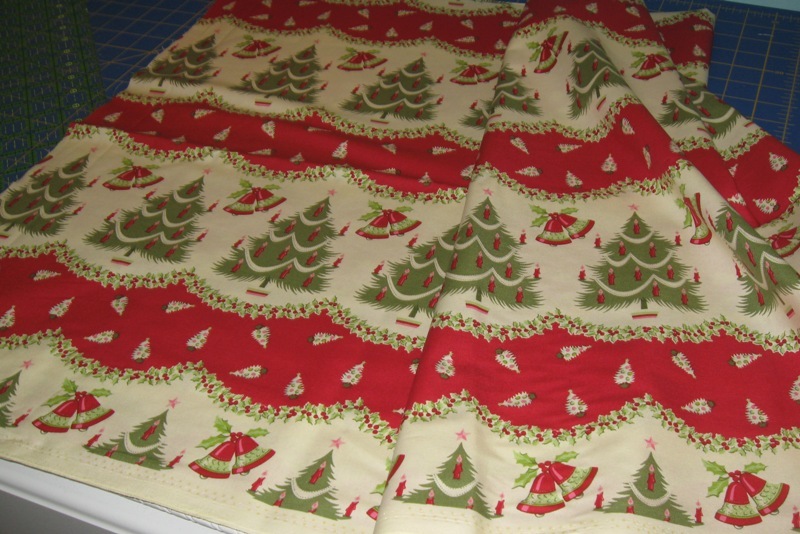 Because every quilter needs more fabric, right?! 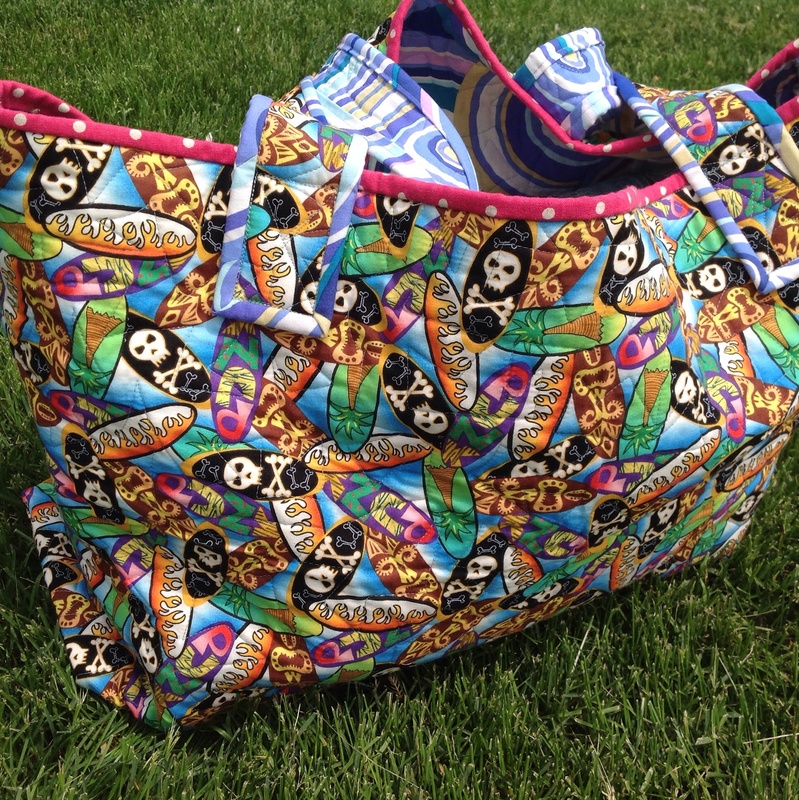 Paige finished up several projects, including a couple of Sophie Bags. I actually thought of stealing this one when I photographed it. I’m in love! What did she spend her $25.00 gift card on? Zippers! And what did she make with those zippers? 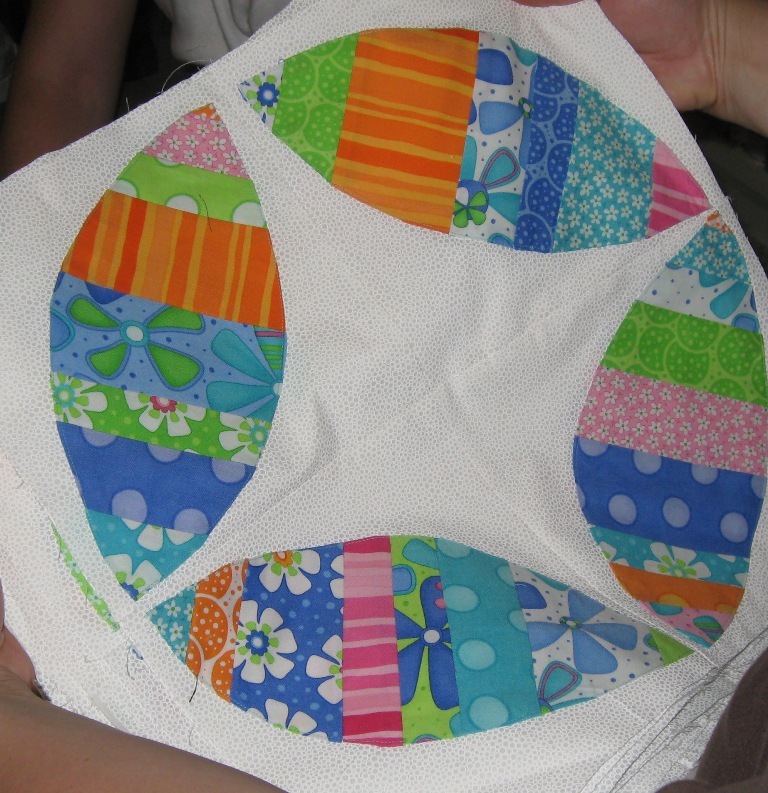 Wendy worked on a few baby blankets & napkins using our tutorial. 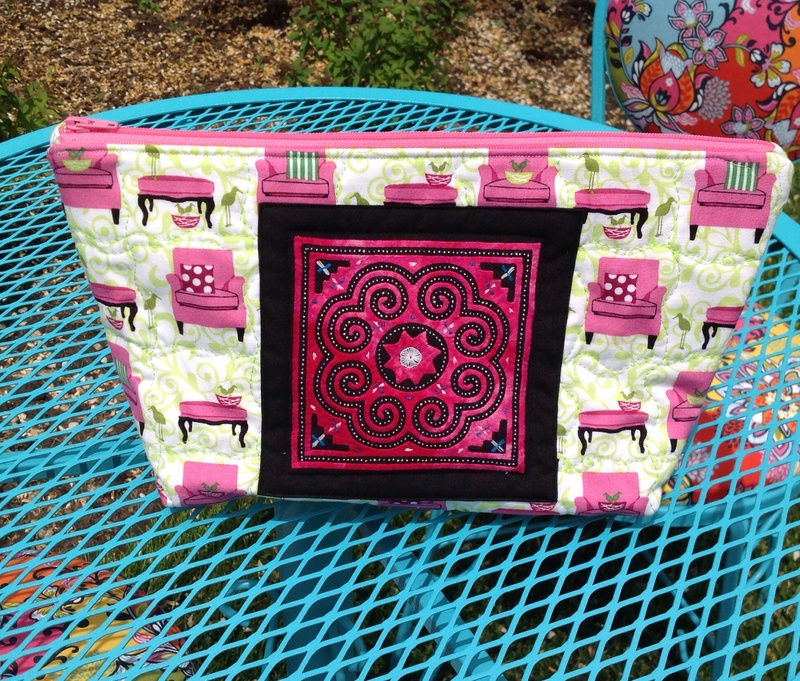 Friends, food and sewing projects. What more could she ask for! I did not attend the weekend of fun but I did manage to accomplish a few things. 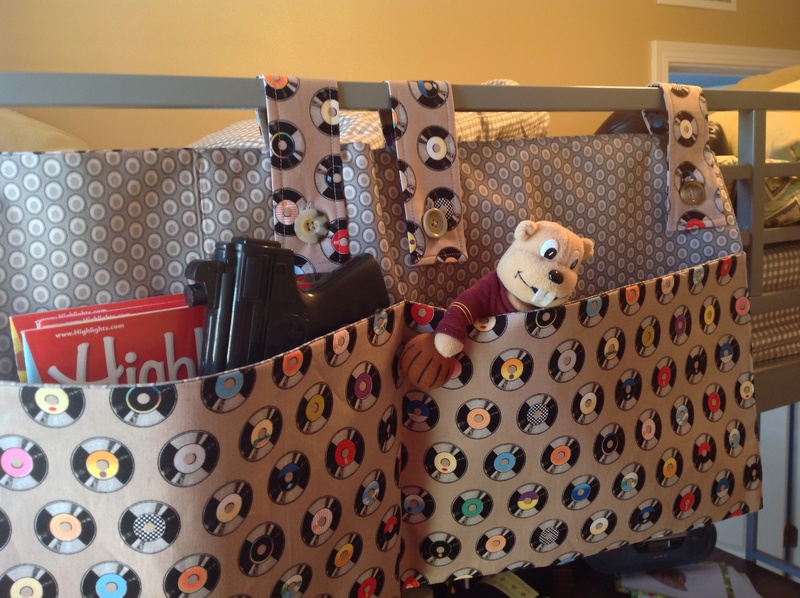 I made this handy dandy bunk bed caddy. I really thought a kid would like it since they usually just toss all of the toys under the bed. This is beneficial for mom and child! 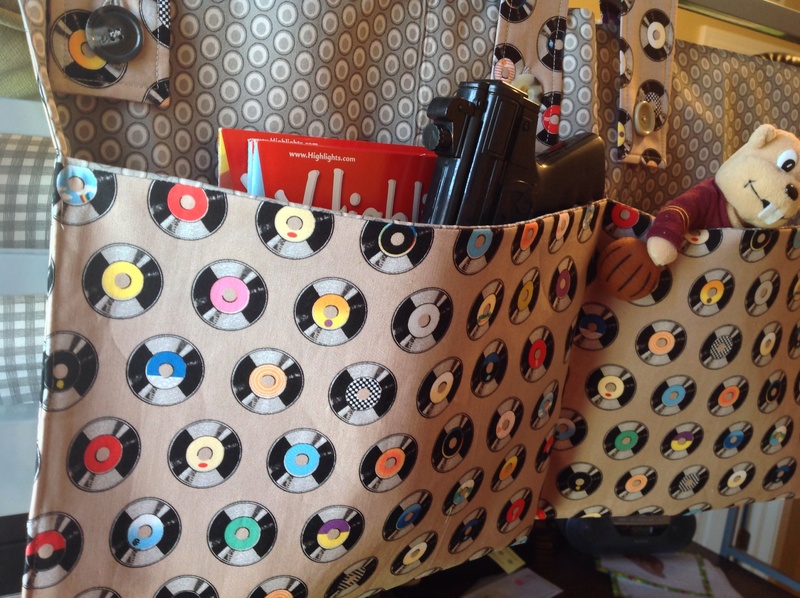 I used Riley Blake’s Geekly Chic Records. But I had to wonder…does a nine year old even know what a record is? Lol! We are down to the last yard of the record fabric. So get yours while you can! Mine was inspired by a tutorial found here. 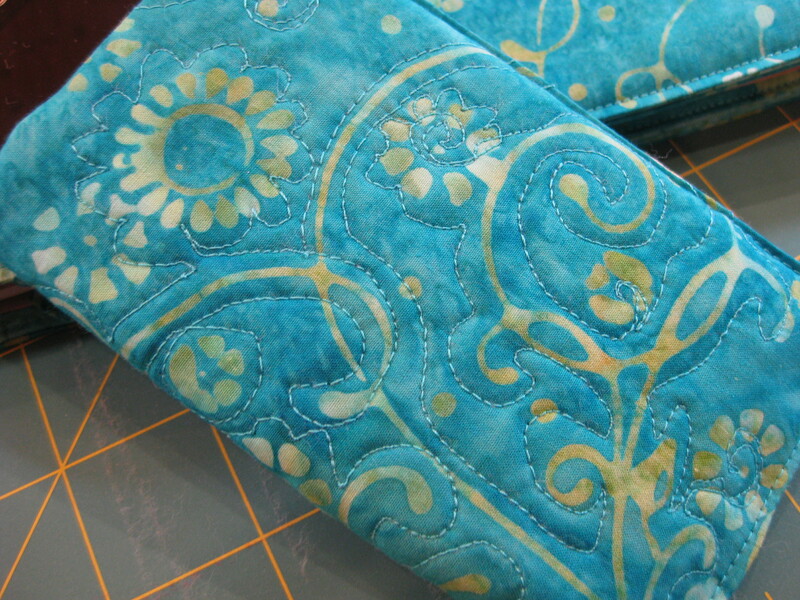 I added fusible interfacing to all the parts and didn’t bind mine but instead turned in the sides and top stitched. 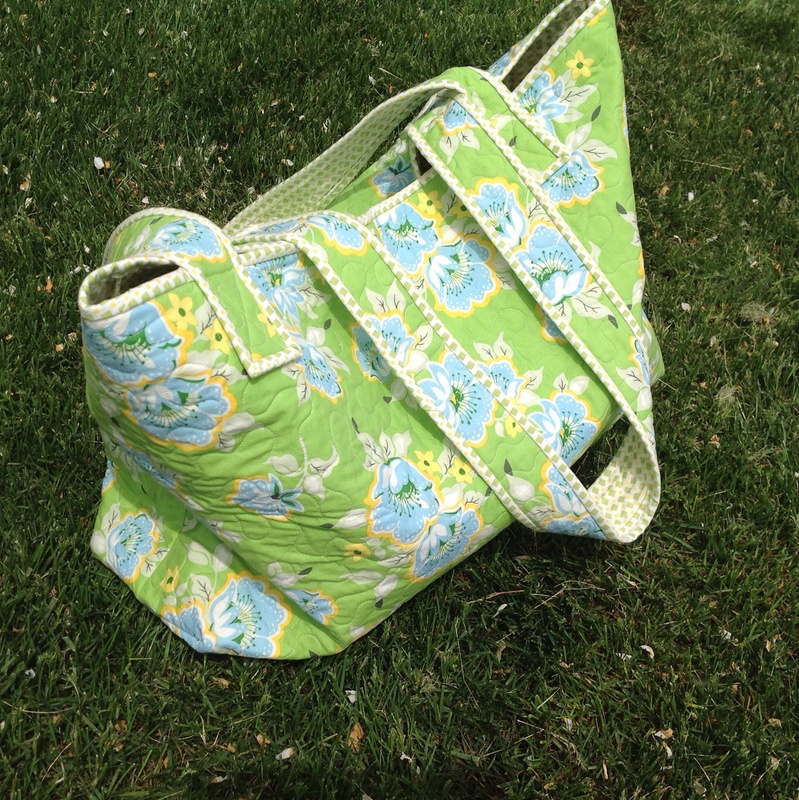 Finally a project to use my buttonhole attachment for! Look for a buttonhole tutorial coming soon…. 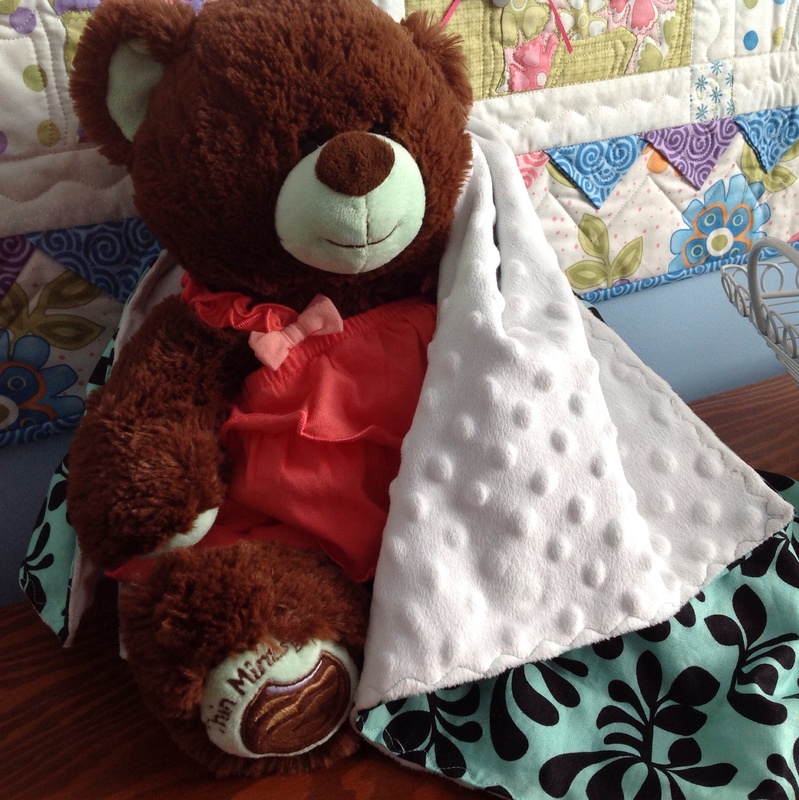 A Minky Blankie for a Build A Bear using our tutorial. Easy peasy! I had planned on making ‘Minty’s‘ clothes too, but happily found out that the newborn size at Target fits just right and at only about $8/outfit! 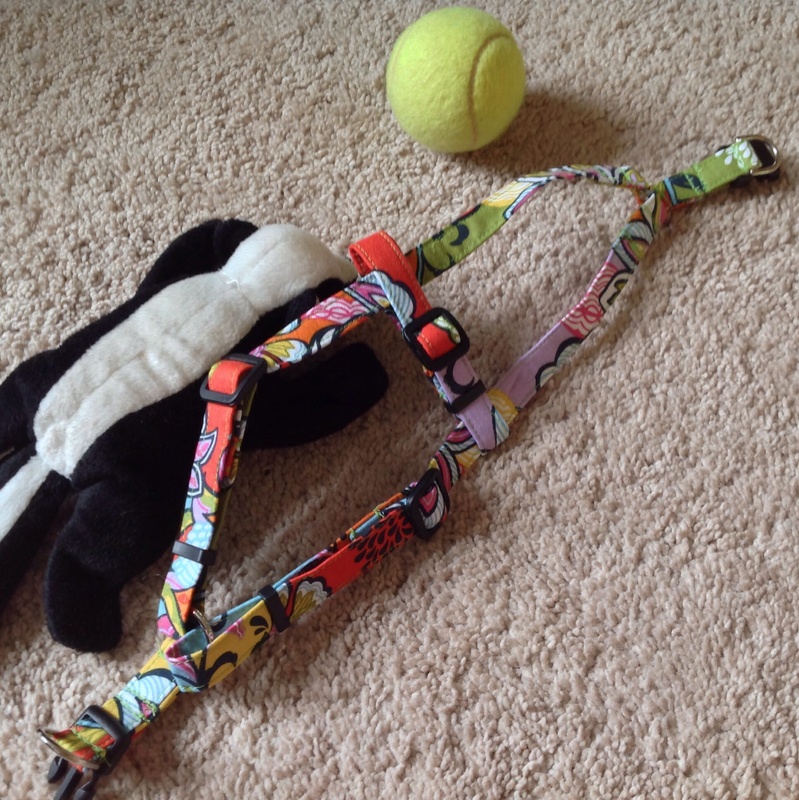 And I made Daisy a new dog harness. 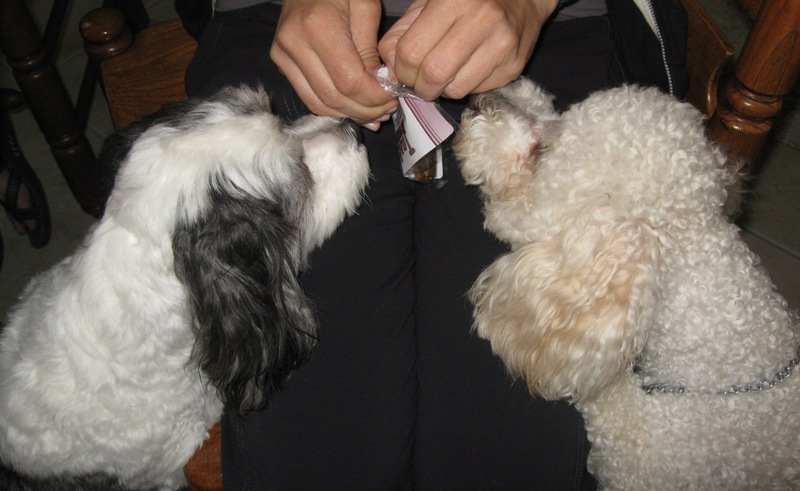 Cause she chewed through her last one darn it! 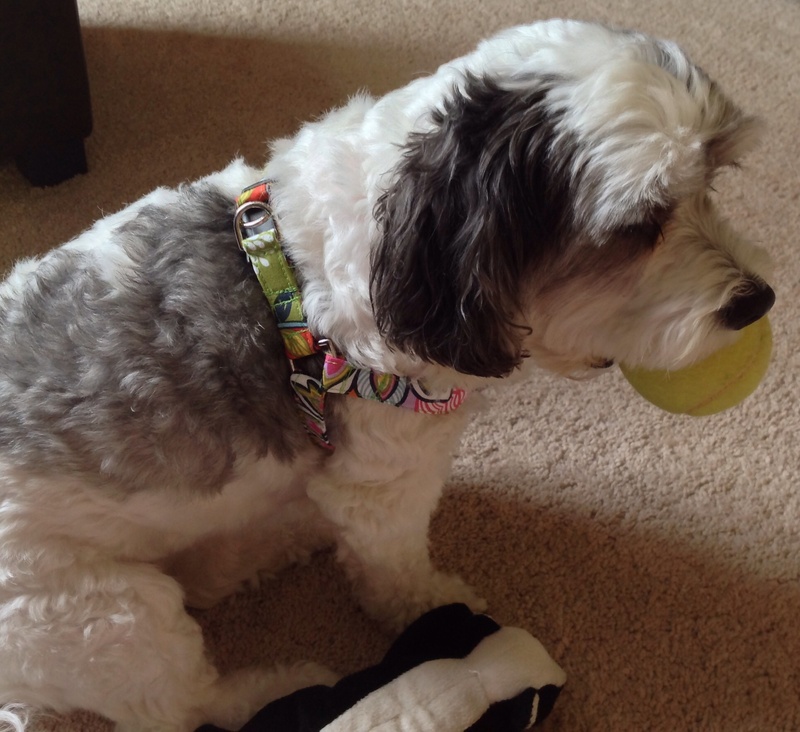 But even though she did that, it still lasted longer than the one I had bought at Petsmart. I’ve been making the harness and leashes since she was a pup. The hardware is a much better quality than the store bought ones and I can customize them for each holiday if I wanted. They take about an hour to make. Pretty simple. The only hard part is sewing around the hardware. So see, handmade is better! Happy Monday:) I hope everyone had as great a weekend as I did! The SewMod studio was put to the test. We always ask ourselves…How many can comfortably fit in there? Will one ironing and cutting station be enough? etc, etc. All those questions a good quilt hostess asks. There were 6 of us, but I can honestly say that we were cozy but comfortable. 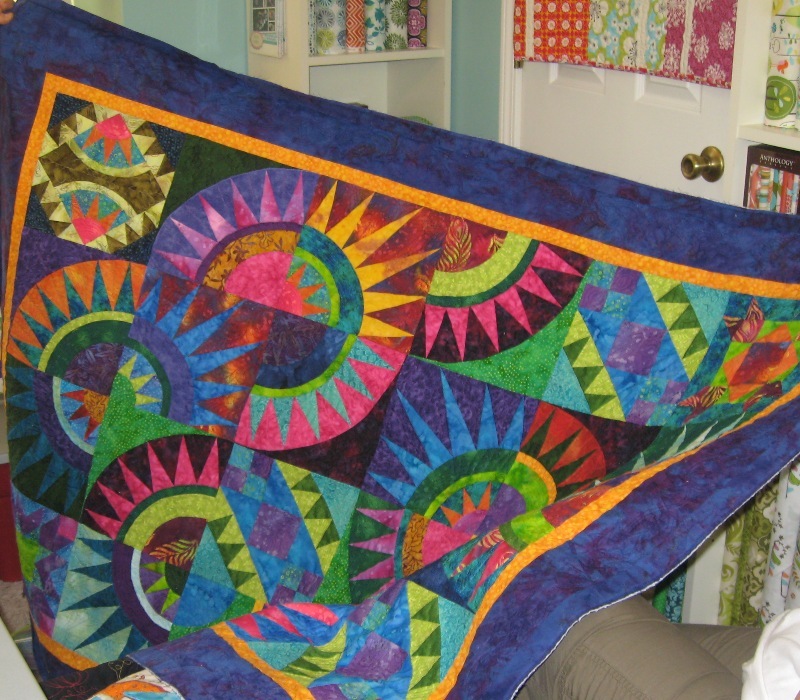 I think quilter’s just enjoy being around each other, showing off their latest achievement, and getting advice from other quilters. 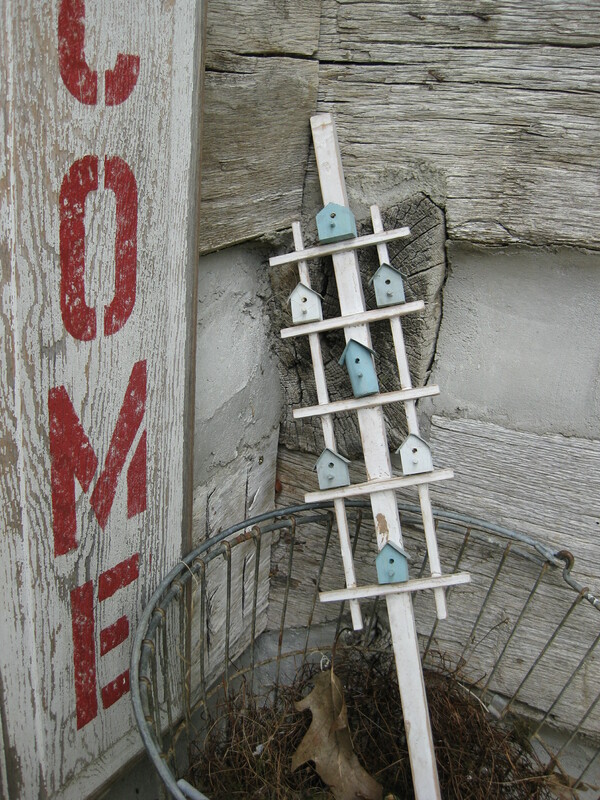 Give us a needle and thread and watch us go, no matter where we are. Now go grab your morning coffee and come see what we were up to! 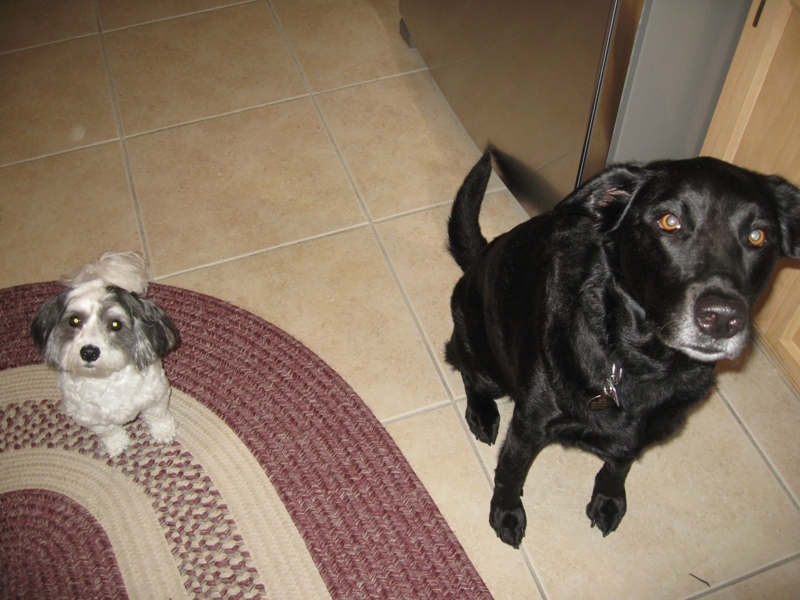 And don’t worry, Daisy also had friends to keep her company…here are Wilson and Daisy beggin’ for snacks. How about we start with a bit of show ‘n’ tell. 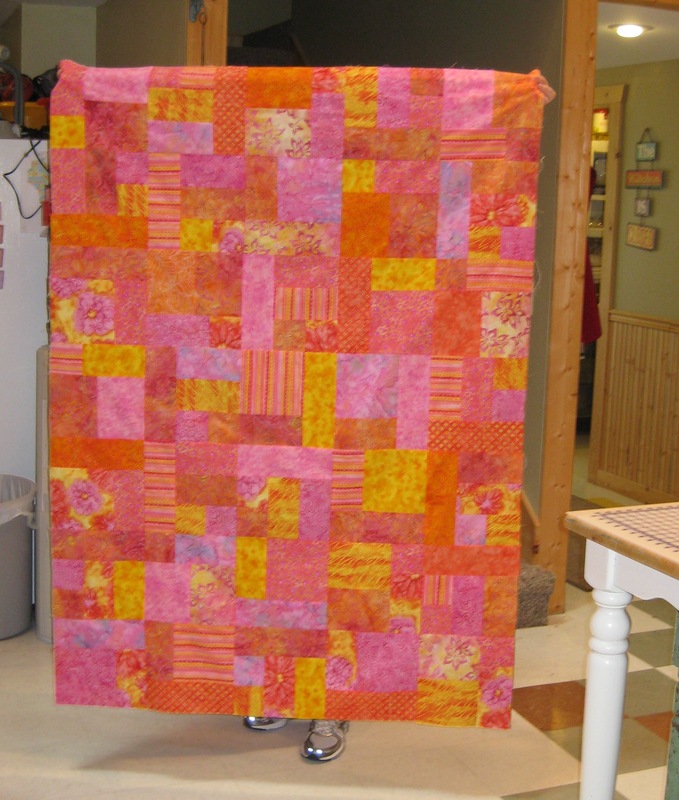 This is a batik New York Beauty made by Karen S.
She made this quilt called Square Dance from Heather Mulder Peterson’s book, Livin’ Large, in Meadowsweet. I’m’ drooling over this! 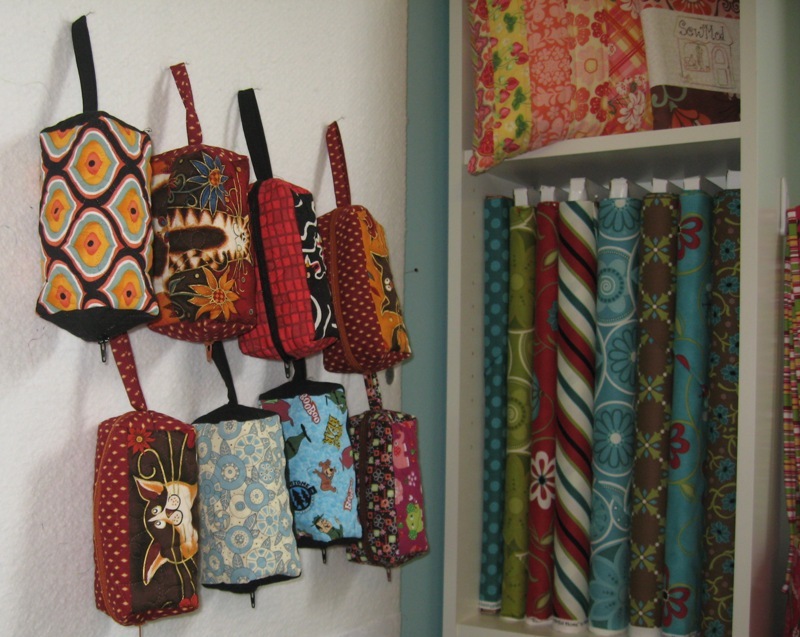 Here’s some bright and happy quilt blocks that Margaret had been working on. Since Paige and I have already “shown” our projects on the blog, I’ll show you what Karen V. brought me. 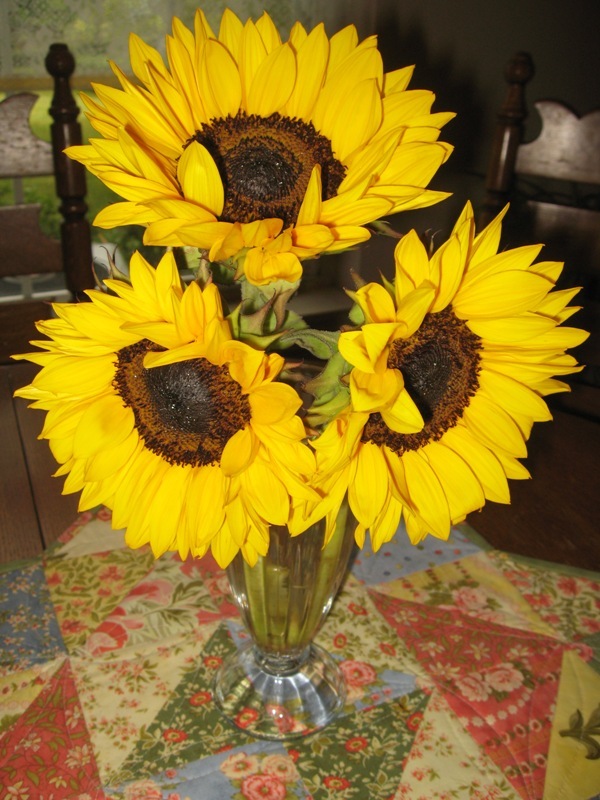 The prettiest sunflowers I think I’ve seen. Fresh flowers always brighten the home. After show ‘n’ tell, it was time to get busy. 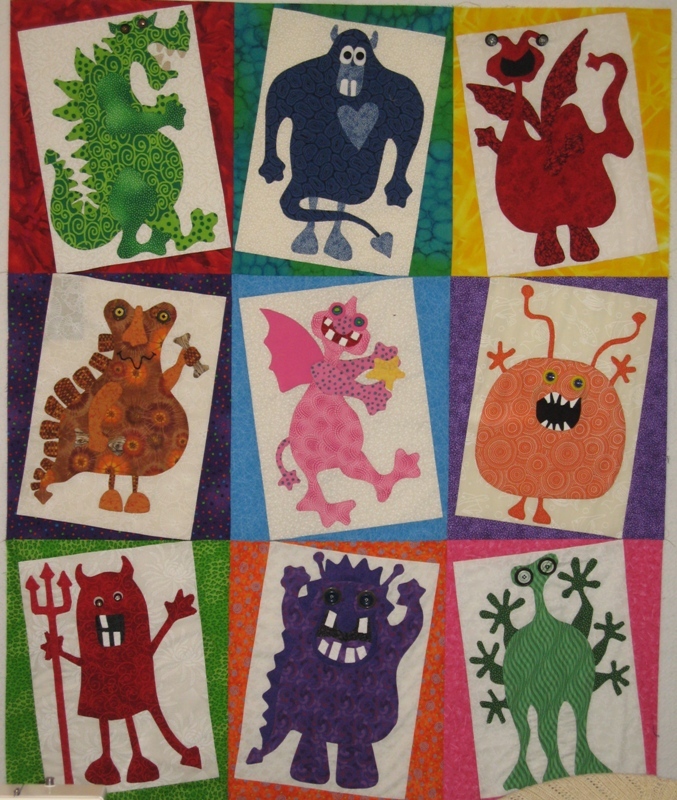 Take a look at the seriously cute appliqued monsters Karen S. worked on. She made us each a cute little sewing pouch. And then whipped up a miniature quilt. She was super productive! Check back tomorrow for Part 2 for more pics from our retreat. See you then! 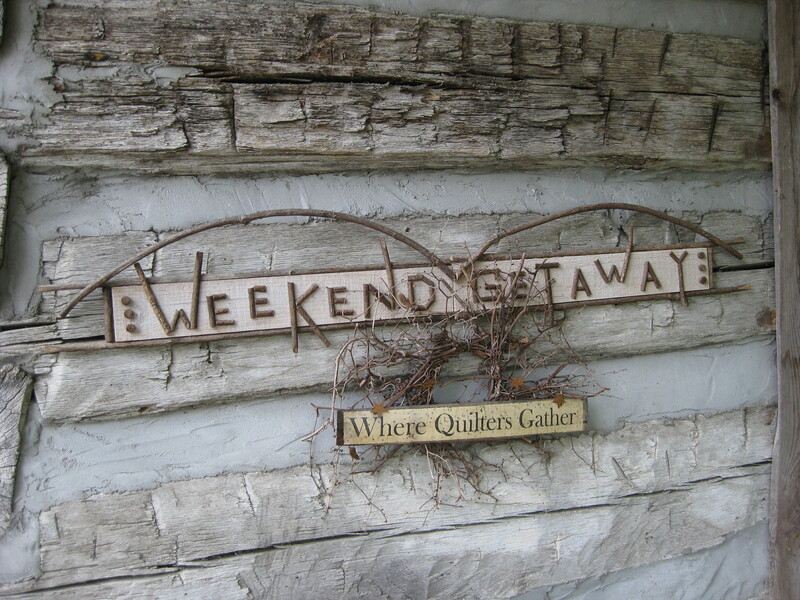 My sister Wendy, Karen, Jen and I just returned from a wonderful quilt retreat in Hillpoint, WI called Homestead about an hour west of Madison. It was Wendy and Jen’s first time, Karen and I were here back in 2007. Friday was a beautiful day to hit the road and drive with the windows open. 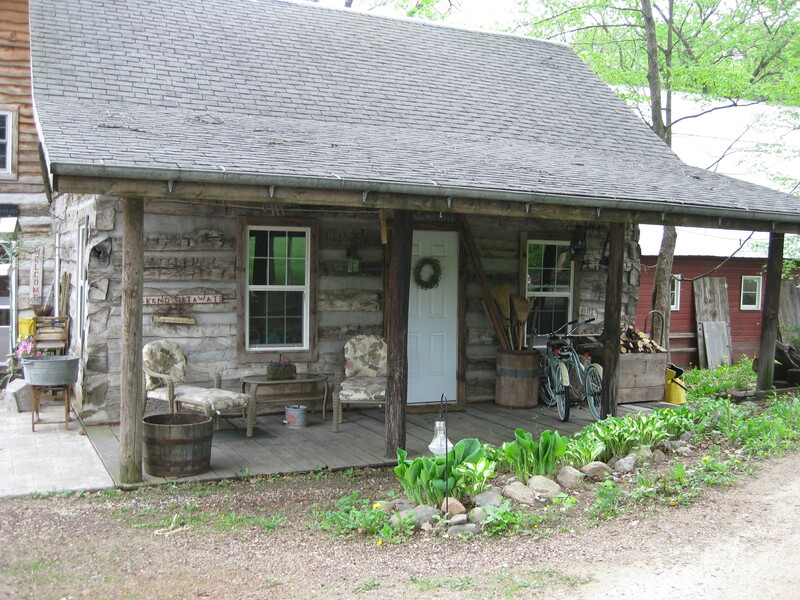 When you arrive you see this quaint restored old cabin which is a gathering space inside to relax and kick your feet up in front of a fireplace but behind it is a large work area which can handle up to 17 quilters. Patsy the owner is a wonderful and personable host making us extremely comfortable we didn’t want to leave! 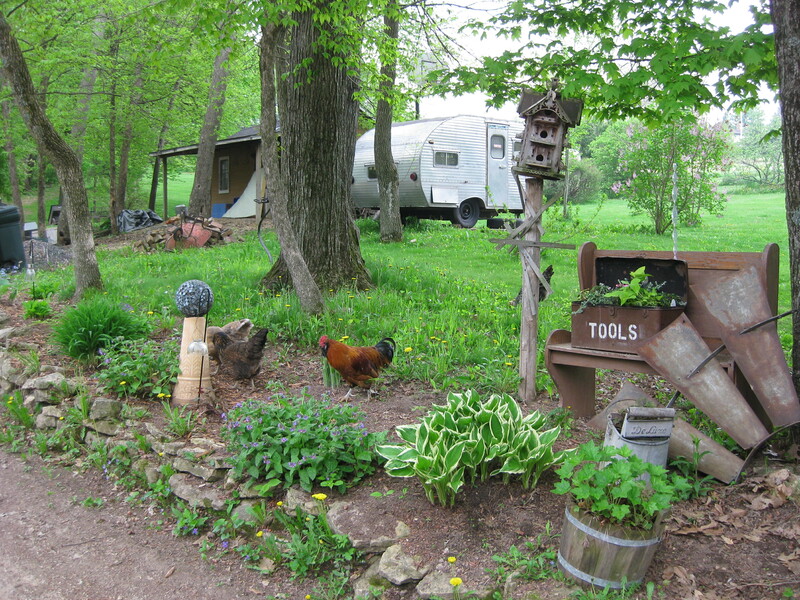 One of her dogs, aka “Juice”, posed perfectly for this shot of the property. Shortly after we arrived, Patsy served dinner and we all hung out on the back porch to catch our breath and enjoy a glass of wine. We then jumped right into our projects. 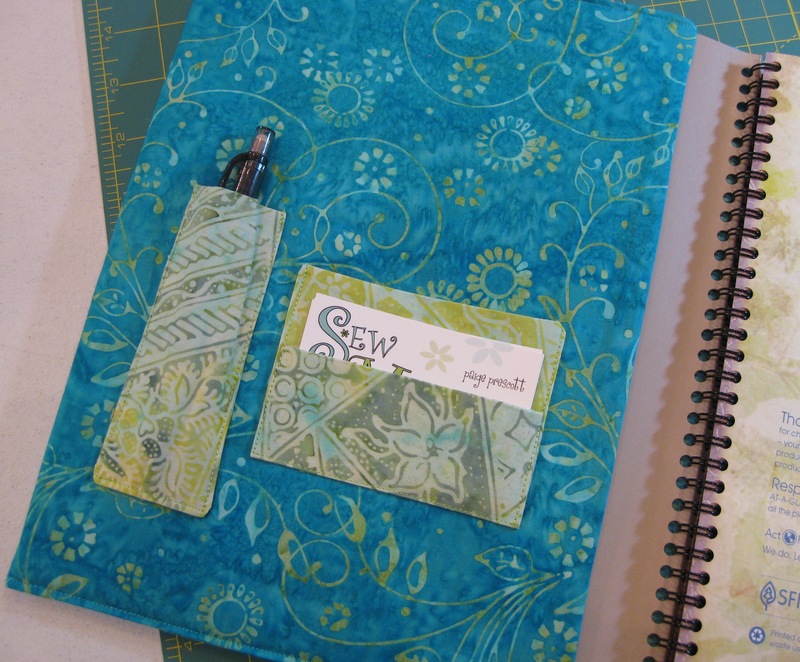 I started with creating a fun cover for my date planner using the SewMod embroidery Lorrie did for me in beautiful varigated thread -look how wonderful it goes this awesome batik! I love this batik so much I couldn’t resist making a cover for my cell phone. I added a pen and business card holders on the inside panel. 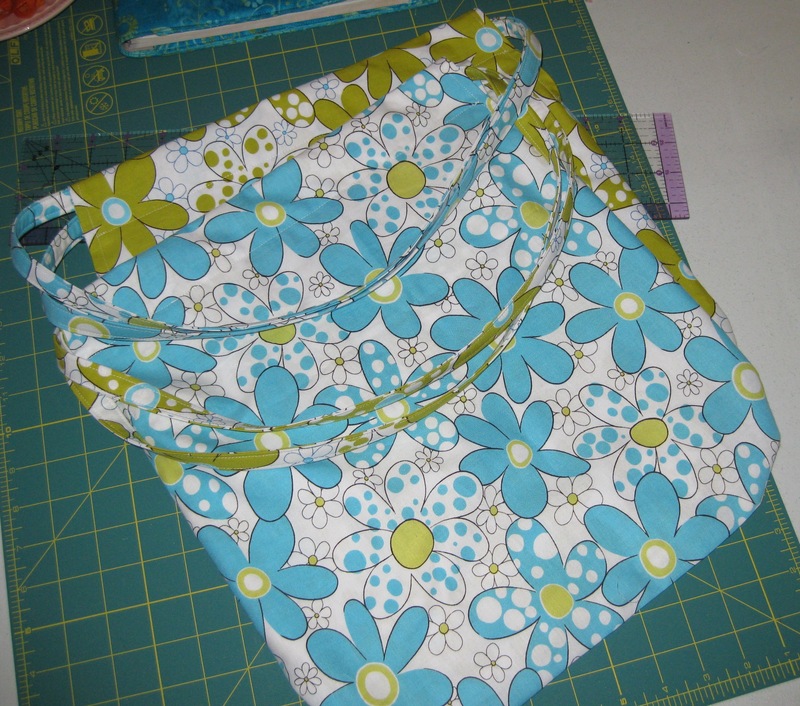 I then tackled an April Bag – a pattern created by Elizabeth Hartman. 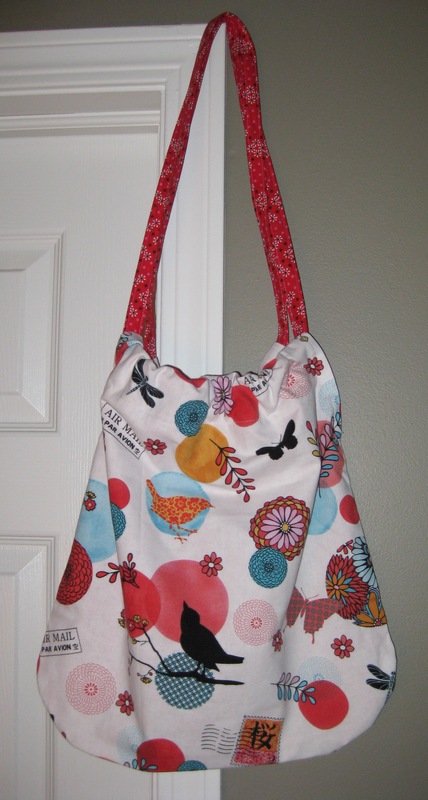 I was wondering what to do with this cute fabric by Daisies and Dots by Piece O’ Cake that matches our SewMod logo so nicely I decided to make a couple more April Bags….but shhhhh, one if for Lorrie! 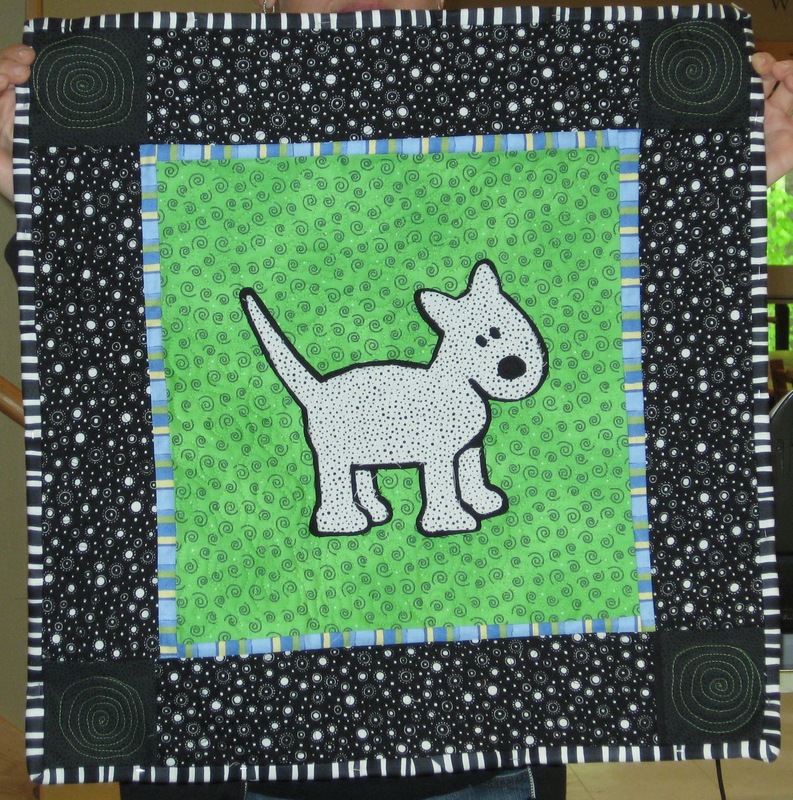 Wendy worked on this adorable doggie quilt…not bad for her first appliquéd project! 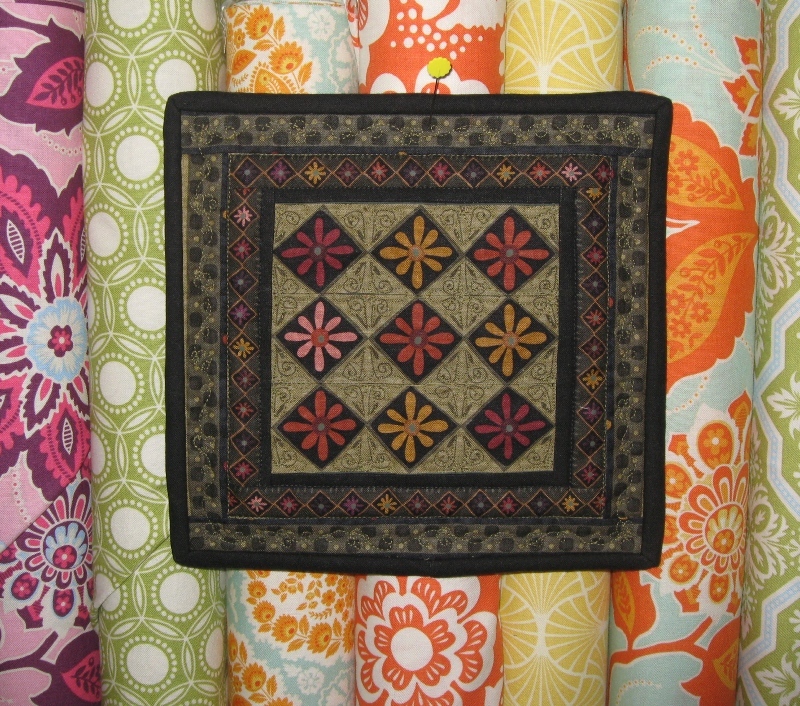 It was a general consensus this block would make a cute lap quilt. Karen worked on a Yellow Brick Road pattern for her cousin. Doesn’t it remind you of the orange-raspberry sherbet! 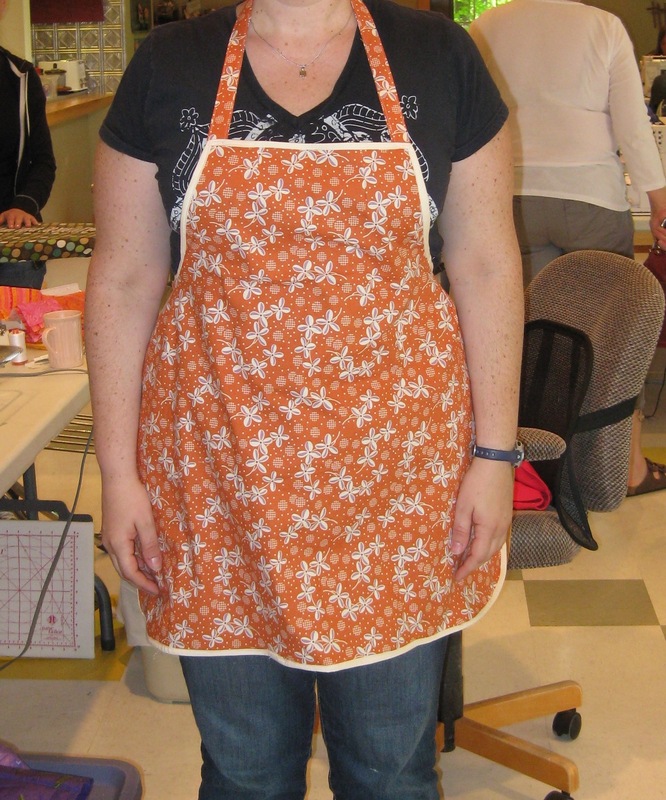 Jen cut out several aprons, I loved this one in an orange/white flower from Denyse Schmidt’s Hope Valley line. 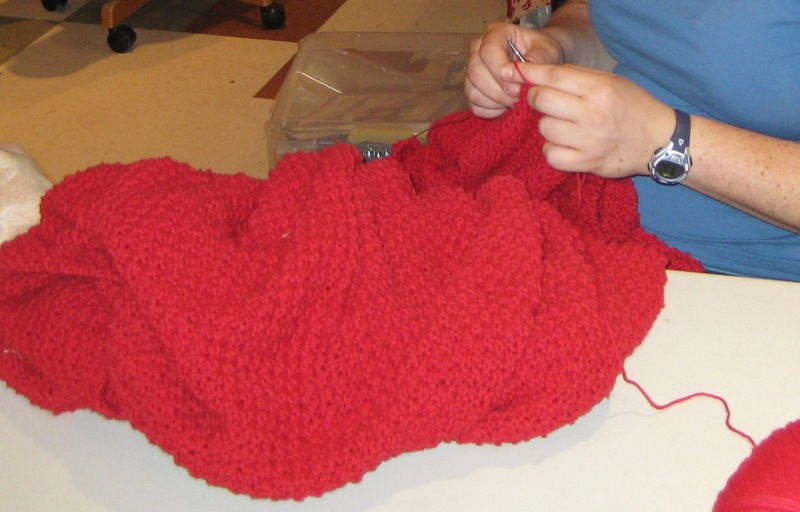 She also completed a beautiful cotton knitted blanket for her husband.